Melbourne removalists calendar for domestic violence support. Melbourne removalists unite in calendar to raise money for domestic violence services. A group of Melbourne removalists have united to launch a calendar to raise money for domestic violence services after being exposed to the severity of the crisis through their work. One of the organisers, Harriet Stewart, said the project was about men coming together to bring awareness to an issue that kills two women every week. Ms Stewart, whose partner appears in the calendar, said the point was to show that “masculinity shouldn’t equate to violence”. “The aim is to show that men need to be asking the question of each other, rather than women just rallying together to protect themselves,” she said. Ms Stewart said the calendar highlights that stereotypically removalists are “perhaps not the kind people that would normally speak out about a cause like domestic violence”. “Firemen often do these type of calendars, but this is unskilled labour, it’s working class. They are the un-sung heroes,” she said. Friendly Moving Men owner Ben Hallpike said his team was just a “bunch of guys that don’t take themselves seriously, but take the issue seriously”. 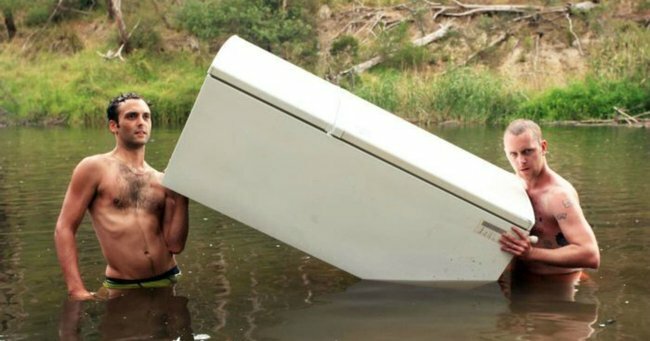 Twenty brief-clad removalists from the Collingwood company came together to pose in the festive calendar, showing they are “willing to go anywhere, and do anything” — even carry a fridge across a river, shirtless. Ms Stewart said the Friendlies team — a mixed bag of musicians, students, artists, sportsman, even an aspiring pastry chef — did not take much convincing when they were approach with the idea at knock-off drinks. “They were horrified by the statistics and excited to help,” she said. The removalist company has a history of working with organisations like Merri Outreach, a homeless organisation that assists women fleeing domestic violence. Mr Hallpike said his team’s exposure to scenarios like these had had a strong impact on the entire company, motivating the men to raise money for the organisations they work with like Domestic Violence Resource Centre Victoria and Merri Outreach. Merri Outreach operations manager Katrina Mcauley said Friendlies are often a “lifeline” for women who need to leave dangerous situations quickly. “We have guys who move women out who have interim intervention orders in place. And they know our clientele really well, they’re always very sensitive to our needs,” she said. “They can be our lifeline from time to time, they can be the difference between things going really well or going really, really bad. “If people get evicted or women have to leave really, really quickly they’re the ones that are there.